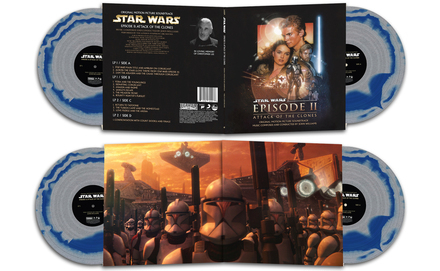 I Am Shark is thrilled to announce the upcoming 2xLP gatefold colored vinyl release of the original motion picture soundtrack to Star Wars Episode II: Attack of the Clones, out March 15th. Available for the first time ever as a stand alone vinyl release, the first pressing will be limited to 1000 copies and is available for pre-order now via the I Am Shark online store. Complete track listing and additional art below. Originally released alongside the movie in 2002, the original motion picture soundtrack to Star Wars Episode II: Attack of the Clones’ 13-track score from legendary composer John Williams has been remastered to maximize the recording’s dynamic range. Continuing with I Am Shark’s innovative variant character color coordination, which saw the vinyl release of the Episode I soundtrack come in 5 different variations, the upcoming vinyl release of the Episode II soundtrack premieres fan favorite Jango Fett’s own colored vinyl pressing (Silver / Transparent Royal Mix). Aside from beautifully colored vinyl and the eye catching imagery featured on the gatefold packaging, there are hints of a hidden surprise included in this album. I Am Shark will soon complete the soundtrack trilogy, following Episodes I (Available Now), and II (Pre-Order) with the first ever stand alone vinyl pressings of the Star Wars Episodes III soundtrack in the coming months. Own Point Break on Blu-ray 3D Combo Pack, Blu-ray Combo Pack, or DVD on March 29 or Own It Early on Digital HD on March 15!